The Big Question: What are the Actions Required for A Resilient and Secure Caribbean? 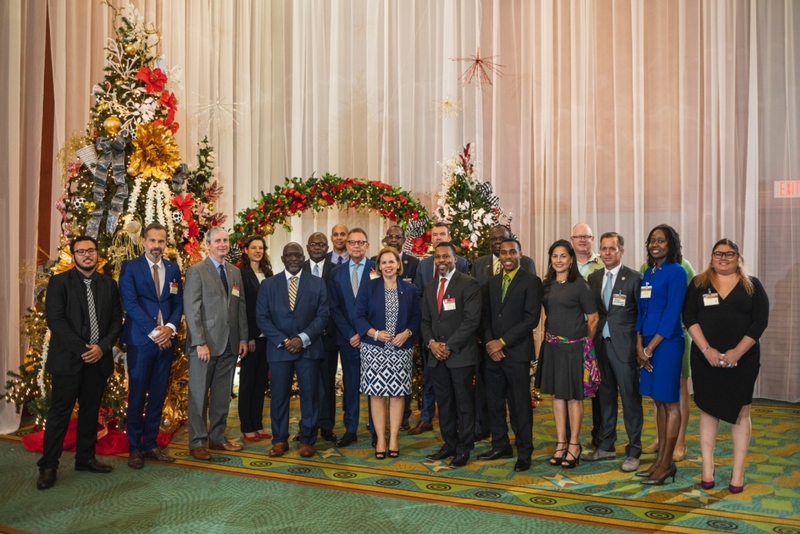 St. Michael, Barbados December 19th, 2018 (CDEMA) – Climate change, development and security issues require commitment to improving sustainable policy actions. Resilient development is not just about survival and bouncing back, but about being able to thrive. 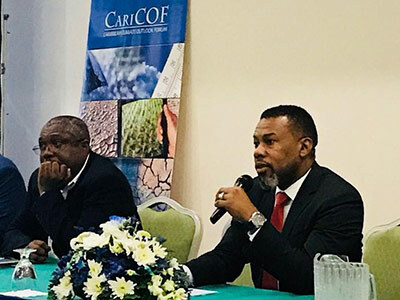 This was the focus of the panel discussion on ‘The Big Question: What are the Actions Required for a Resilient and Secure Caribbean?’ with regional policy makers, practitioners and the youth during the regional consultation on ‘Climate and Security in the Caribbean: A Roadmap to Resilience’, which was held at the Renaissance Convention Centre in Aruba on December 13, 2018. Read more: The Big Question: What are the Actions Required for A Resilient and Secure Caribbean? Two weeks of training on Hazard, Vulnerability and Risk Methodologies for intense rainfall and coastal flooding culminated with a presentation of the results on the 28th November, 2018. The results included hazard, risk and vulnerability maps for the pilot community of Dennery, Saint Lucia. As part of the training, the group went into the Dennery community to undertake a risk perception survey. Preliminary results of the survey indicated that community members are not all aware of household and community evacuations plans. This represents one of the areas requiring strengthening in Dennery that should be incorporated into the development of the community disaster risk management plan and to inform training interventions. Bridgetown, Barbados November 28th, 2018 (CDEMA) – The deepening of existing commitments on gender equality in the implementation of the Comprehensive Disaster Management (CDM) Strategy 2014-2024, is the focus of a new Memorandum of Understanding (MoU) between the Caribbean Disaster Emergency Management Agency (CDEMA) and the United Nations Entity for Gender Equality and the Empowerment of Women (UN Women). 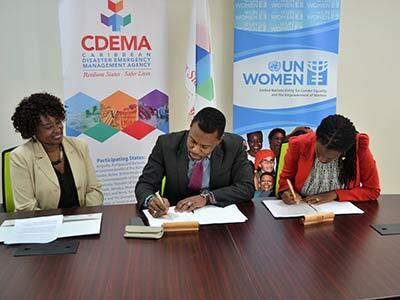 The MOU signing took place on November 14, 2018 at the CDEMA Coordinating Unit in St. Michael, Barbados. 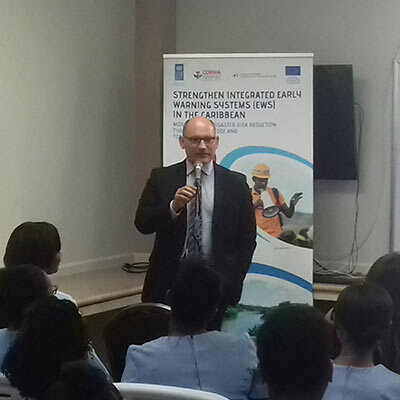 Bridgetown Barbados, November 22nd, 2018 (WMO) - An initiative to strengthen multi-hazard early warning systems in the Caribbean was launched on November 20 during the dry season Caribbean Climate Forum (CariCOF) meeting held in Accra Hotel in Hastings, Barbados. Providenciales, November 1st, 2018 (CDEMA) – The Caribbean Disaster Emergency Management Agency (CDEMA) donated 88 laptop computers to the Ministry of Education, Youth, Culture and Library Services in the Turks and Caicos Islands (TCI). 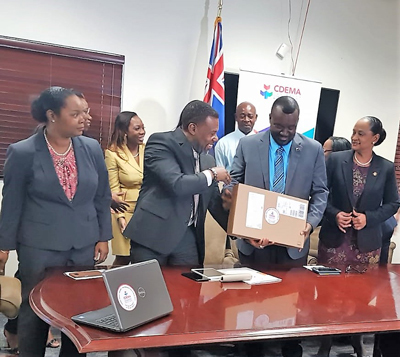 The computers were presented to the Ministry at a handing over ceremony held at the Premier’s Office in Providenciales on October 31, 2018.